This is a good read by Kyle Whitmire. Clink on link to read full article. Blogger Comments: We know first hand all about public corruption here in Morgan County. We know so much we may have to write a book one day. I think the people in the great State of Alabama are tired of the corruption that has been going on for years, and this last election can prove that. Drain the swamp one at a time. You want to prosecute public corruption? Are you crazy? Before you answer, I want to show you something. It’s a chart made from data I pulled several months ago, and it shows the history of public corruption prosecutions in the Northern District of Alabama. If you look at it, you will see prosecutors there make about six public corruption prosecutions per year. Sometimes a few more. Sometimes less. Sometimes none at all. But once there were a lot more — a virtual explosion of political crime-fighting that, like black holes colliding in deep space, sent gravity waves rocking the fabric of Alabama politics. In 2005, the NDAL prosecuted 25 public corruption cases. Then, in 2006, it prosecuted a whopping 42. That was the work of the United States Attorney Alice Martin’s public corruption unit, led by then-Assistant United States Attorney Matt Hart. 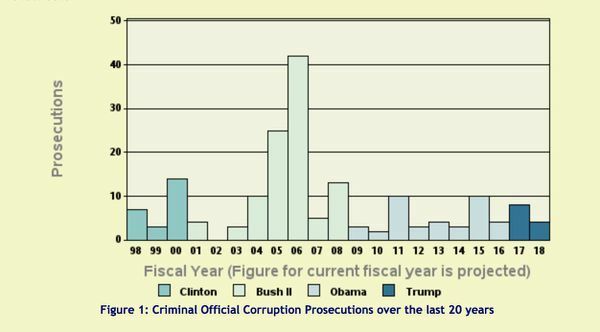 By 2009, however, those prosecutions had regressed to the mean, as the statisticians say — or as everyone else calls it, business as usual. President Barack Obama replaced Martin with a prosecutor who was much less aggressive. The new US attorney reassigned Hart to immigration enforcement, and he soon left for another job at the state. What I find most appalling is the fact that if a citizen of the county attempts to vocalize and expose such corruption...that citizen is threatened, sued, and persecuted by such corrupt individuals with power. The fact that it's on display for everyone to see and yet nothing is done...puts a damper on the justice system being legit. Maybe it's just slow. But one thing for sure is it seems back asswards.